Stormwater runoff is created when rain or snowmelt accumulates and runs across the surface of the land. Undeveloped, forested landscapes generate relatively low amounts of stormwater; however, as residential and commercial land development proceeds and paved (impervious) surfaces replace forests or meadows, the amount of stormwater increases. Rain and snowmelt are normally absorbed by leaf litter, soil and plant roots. Rainfall and snowmelt also filter through the ground and provide recharge of groundwater. When forests are removed, soil can be compacted by construction, thus reducing the amount of infiltration and increasing the amount of rainfall runoff. With development comes the creation of impervious surfaces in the form of parking lots, driveways, roads and highways, as well as rooftops of homes and buildings. Rainfall landing on these surfaces can no longer infiltrate the soil and increased stormwater runoff is created. These increased amounts of water can cause flooding or damage to infrastructure such as driveways, roads, culverts and bridges. Stormwater also has the potential to degrade streams or other surface waters by bringing with it contaminants or increased water temperatures from paved surfaces. Contaminants – as an example salt used to treat winter roads – can be carried by snowmelt stormwater and can impact groundwater and drinking water supplies. 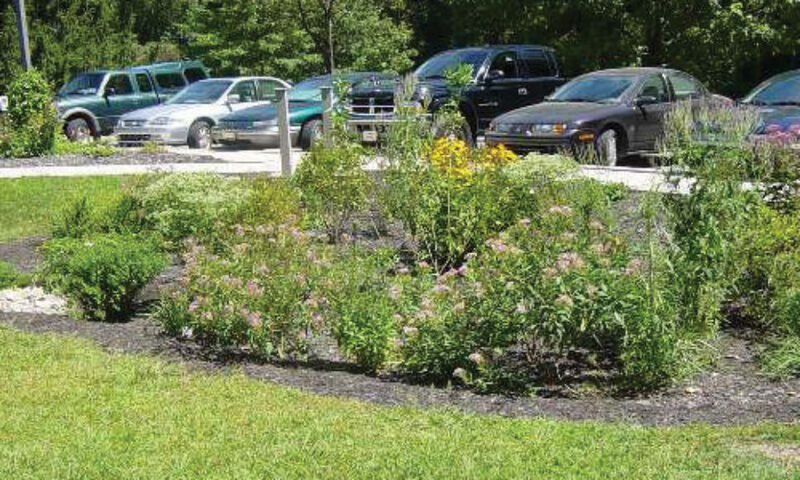 Stormwater is a resource that can be managed to the benefit of residents and the environment. The most effective strategy for stormwater management is to prevent it from the being created in the first place. This management starts with each individual property owner reducing runoff and trying to infiltrate the runoff produced by your home rooftop and driveway into the soil on your own property. So what can you do around your home to reduce stormwater runoff from your property? OR to reduce contaminants carried by this stormwater? Use rain barrels to collect rooftop runoff for recycling – water your vegetable or flower gardens. Reduce the amount of deicing salt used around your home. Never dispose of cleaning chemicals, motor oil, or other contaminants on the ground. There are so many ways you can help reduce stormwater and the contaminants it may carry in and around your home. Use innovation and common sense and handle your own stormwater on your property.